Maybe I should give you some background as to how all of this came about. Esther and Steve have been reading our blog for a few years, and this past summer they were making a trip in their motorhome from Calgary to Ottawa, and the route came right by the park we were running. They asked if they could stop in and say hello, and of course we welcomed them to stay for a few days. We got along well, and their last night at dinner, they said they had a surprise. From reading this blog, they knew that we had already booked a trip to South Korea. And it turned out they were going to be in South Korea at the same time as us! How strange is that? Anyhow, it turns out that their son Brady was marrying a Korean girl, Jiwon, and the wedding was October 4th and that we were invited to attend! Because of the distance, very few people from the groom's side of the family were able to attend. So we were happy to be able to take up a few seats! But because we had come to Korea to visit our friend June, we didn't want to take our time away from her. So they said that she was invited as well! This was a photo from the electronic invitation that we received. The wedding was outdoors, which to begin with is very non-traditional. The venue was Yangjae Citizen's Forest , a park that had been built for the 1988 Seoul Olympics. The wedding venue at Yangjae Citizen's Forest. But this part was very traditional. The parents of the bride and groom are wearing traditional Korean formal wear. More about that later! Then, we got started. It was a very short ceremony and with no officiant other than a master of ceremonies who led things and explained things in both English and Korean as they went along. The "official" part of the marriage only takes place when they go to city hall and fill out the forms! In the photo above, you can see the mother of the groom (Esther, on the left), bowing to the mother of the bride. There is lots of bowing going on in Korea! The groom, Brady...walking down the aisle. The bride, Jiwon, and her father. Then, they had each written their vows. This part was all done in Korean! Brady of course had to read his from a cheat sheet. Korean is not an easy language to learn, and he stumbled a little bit at times but we thought he did really well! June said that she understood everything he said. Essentially, he was saying that he would tell her he loved her at least once per day for the rest of their lives. Nice. Then, the fathers of the groom and bride had to give a speech. Here's the father of the bride doing his bit. And here's Steve, the father of the groom. That was it...and they were husband and wife! Brady and Jiwon, the happy couple! They did a little cake cutting ceremony. And then they did some family photos. This is with the bride's mother, father, and brother. And then it was time to eat! They did a huge buffet of typical Korean food. June was there to ask the servers about what items might contain gluten, and it turned out that there was a lot that we were able to eat. June, showing us how to open this funny fruit. Can't remember what it's called! Very sweet and with a very different flavor. Nice, but messy to eat! Us, with the groom's parents. Steve, Esther, Ruth, Kevin. Now, you will have noticed that the parents of the bride and the parents of the groom are wearing Korean traditional formal wear. "It's traditional Korean formal wear, called Hanbok. What's amazing is the number of layers in the woman's outfit. It's a very old style of dressing which involves pantaloons, crinoline, under dress, under blouse, over dress and jacket-all tied and belted in a very specific way. I needed help getting into it all! " After lunch, we had a break of about four hours where we could head off and do whatever we wanted until the "After-party" that didn't start until 6:00pm. We decided to hop on the subway and go downtown to pick up our wireless internet device from Wi-Fi Korea. This device works all over Korea and enables us to have internet where ever we go so that we can give you these regular updates! The Seoul subway system is amazing. And relatively cheap. Depending on the length of your journey, you pay between $0.90 cents and $2.50. It's very efficient, modern, and spotlessly clean. I'll get into it in a little more detail in another post. After we picked up our cell device, we just wandered around the Insadong area. It's a popular pedestrian street that also attracts a lot of tourists. On the weekends, it's closed to traffic and it's a good thing. There would be no room for cars! Lots of English, especially in the tourist areas. Standing in line for our free tea! It was really good! A shopping area that winds it's way up three levels. Notice that everyone is walking in the same direction. Korea is a very organized country. June, buying a bag of chestnuts for a yummy snack. They were a little pricey at 5,000 won. ($5.75 CAN), but they were good! Our western tradition of having a party to celebrate the big wedding event is in fact a western tradition. This is something that is definitely not done here in Korea, and it was actually a bit confusing for some of the Korean guests. It's just simply not something that's done. So this was where it was really only for the grooms side of the family. Just a small gathering, of about 40 people. But we had a blast! The party venue was the basement of an old warehouse that is transformed to an event place. One of the guys is a Ukranian Folk dancer. He was showing the other guys how to do it. Can you tell which one has the best form? But by 10:00pm, we were zonked. It hit us all at once. We went from partiers to party poopers in a time frame of about 10 minutes! June's boyfriend came and picked us up, and we went back to the apartment to sleep! The original plans was to write this up when we got home so that you would have your morning edition of the blog, but there was no way. Huge thanks to Esther and Steve for inviting us. 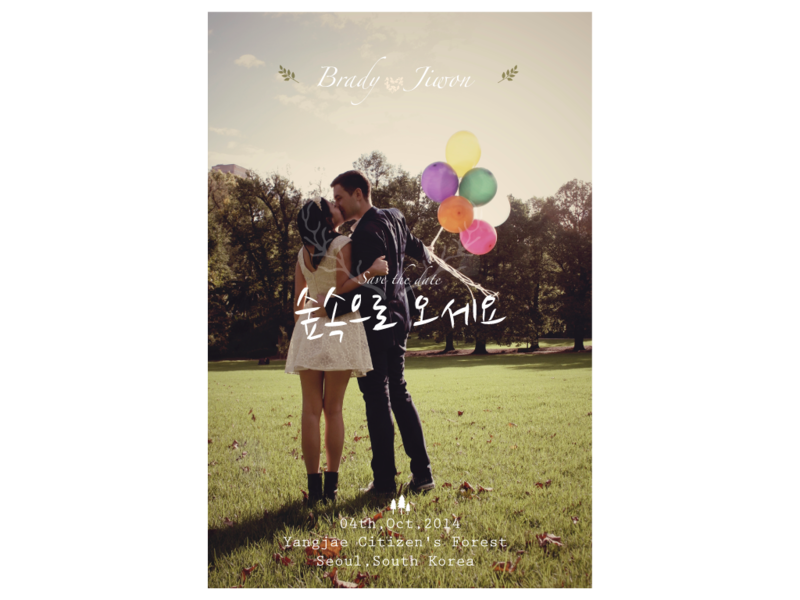 We had a fantastic time and it was fun sharing Brady and Jiwon's special day with you! Great synopsis Kevin! Thank you so much for taking the time to spend with us, we certainly enjoyed having you both as well as your friend June and Park join us. Hopefully our paths will cross again in the not too distant future! And, thank you Esther and Steve for inviting us to Brady and Jiwon's wedding. We had a fantastic time and were so happy to be included in this special event. Hoping to make it to Jeju on Friday, so hopefully we can meet up there, if not I am sure our paths will cross again. Wow....what a neat experience. Tons of memories to last a life time. I don't see Kevin in the Ukranian line dancing photo. Definitely a fantastic experience! It was just such a perfect day. Fantastic! Really wonderful to see. I'll bet it was a bit strange for her parents. Did they meet in the states at school? Long way to go for a wedding. Yup the Ukranian is second from the left. Right?? Love the "reception" glasses and Ruth's mask. I know what you mean about partying one minute and being hardly able to keep your eyes open 5 minutes later. Happens to me all the time and I didn't even fly 14 time zones or whatever it was for you guys. How DO you always manage to get wifi at a price you can afford? I hope Kevin won't mind if I take the liberty of answering a few of your questions Sherry! They met in 2011 in Australia where they were both working at the time. Thank you Esther for answering Sherry's questions. We don't mind a bit and with you answering them, this way she will get the correct information just in case we didn't have it quite right. Yes, you were right Sherry, he is the one that is second from the left. As for finding affordable internet, Goggle is your friend. Kevin will provide more detail into our MiFi device in another post. Thank you Donna! It was so nice to see them do the wedding their way by incorporating some traditional and non traditional customs into it. We loved seeing the parents of the bride and the groom in the traditional dress. What fun ... such a nice experience in a country that is so different from ours. We have always felt that going to a wedding or some other special event is one of the best ways to experience the culture of that particular country. We were so honoured to be part or Brady and Jiwon's special day. We had an amazing time and it was such a great start to our trip here in Korea. That picture of Kevin with the glasses, just cracks me up! How on earth did June and Ruth wind up in that enormous display case? Oh wait---I now see the shoeprints in the food in front :) Thanks Brady and Jiwon for inviting us all to your wedding! So glad that you got to enjoy the wedding through our eyes. What a great treat for us, your followers, to be able to share the beautiful wedding of Brady and Jiwon. Thank them for all of us, living vicariously through your blog post. Wonderful treat for all! Thank you so very much Mary-Pat, we will be sure to pass this comment along to them. What a great time and truly exciting experience. Kevin: How are your feet today? Great pictures! They were sore that evening and only a little bit sore the next day other than that, they were fine. Now that's what I'm talking about - what a delightful wedding & reception experience - that was awesome! Best wishes to Brady and Jiwon! Thank you so much for sharing! So glad that you enjoyed the post Connie and Barry. We certainly had fun sharing it with everyone. They truly are such wonderful people and we were so honoured to be part of their special day. The fruit is rambutan. What a fun event! Thank you Kathe for identifying the fruit for us! I knew that somebody would eventually. I hadn't had time to try doing a Goggle search on it. You can't beat a good wedding (or funeral) experience in a different country, a great way to learn and such a privilege. Glad it worked out so well for you. That is exactly what we think too. Luckily we have been to lots of weddings and no funerals, hopefully we can keep it that way!